Henry’s mother was not like other mothers. She’d given her boy four names Henry Horatio Heldur and her surname Hunter, but now seemed incapable of remembering any of them or indeed that she had a son at all. And Henry was not like other boys. After all, it was from Henry, the incredible disappearing boy himself, that Thomas had learnt a trick or two. It was all so very complicated, that Henry had had to map it out in one of his notepads, ostensibly so that Thomas could get a grasp of the finer details, but since drawing gave Henry the greatest pleasure, more even than the multiplication table, this might also have been a secondary motive. 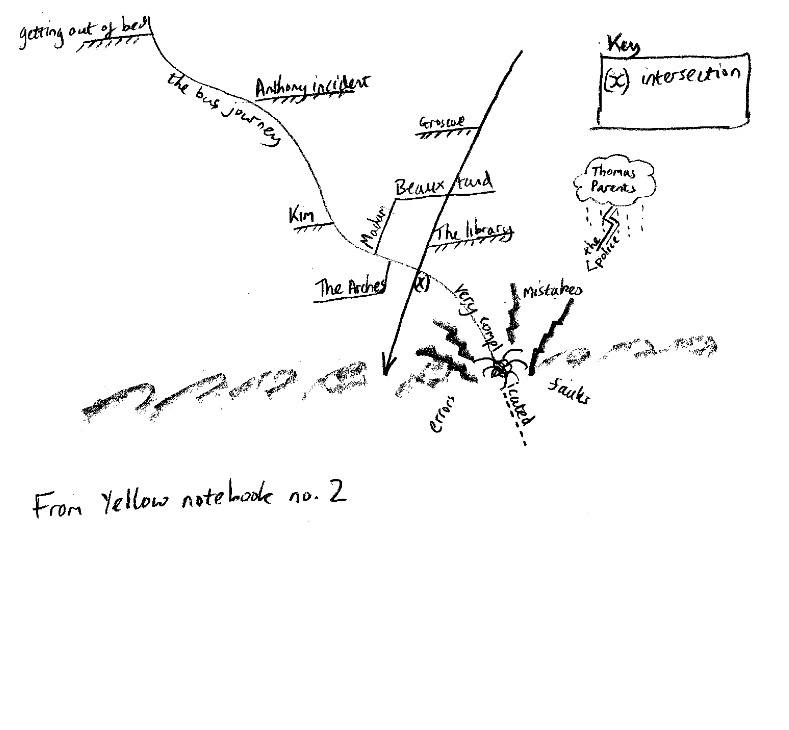 The resulting map looked a bit like a line dropped diagonally, transacted by another at a steeper angle, and finishing in a spider like knot, that might have represented the moment of splash down of some uncontrollable flying object, but was in fact the descent from muddle into maelstrom. But then, Henry began to elaborate with little diagrammatic intersections, and the whole thing began to take shape. He began with his bedroom showing clearly the position of the bed and various hypothetical alternatives. Not that everything had been awful that week. But pretty much everything had. What’s more, pretty much everything had been awful for as long as Henry cared to remember. And yet nobody else cared notice anything was wrong at all. And even Henry couldn’t put his finger on any one day and say, hand on heart, that yes, here is where it had all begun to get a little screwy and that from this or that hour and minute and from then on, everything had been wrong, one way out of bed or another. Henry felt sure he had got out of bed on the wrong side. In fact, he almost always got out of bed on the wrong side. He had tried different sides. He had moved his bed away from the wall. He had even tried the top and the bottom. But it was all wrong and the best thing, he was sure, was to stay put. He certainly wished he hadn’t got out of bed that morning and remained snug in his room with his things and none of this fuss. He did what the other boys did. He played because they played. He laughed when they laughed. |Smoked because they smoked. That was part of remaining invisible. He liked the passing of the cigarette from lips to lips like a secret. He liked being there. Being part of it. Secretly.